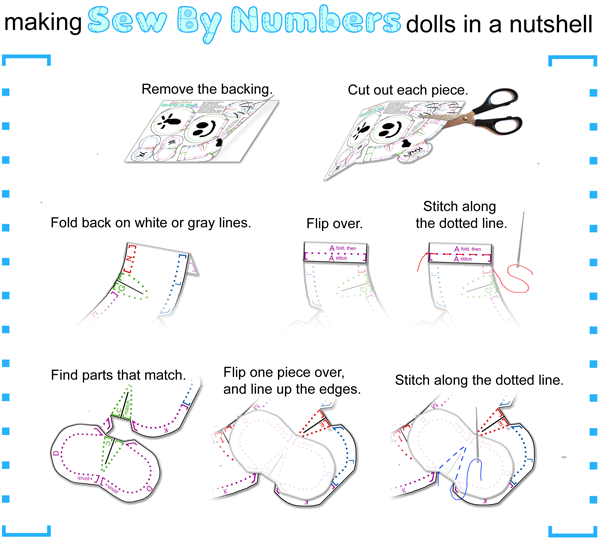 To make a Sew By Numbers piece, print the template out with an inkjet printer on printable fabric and remove the backing. The instructions print out for you on the same piece of fabric that your pattern is on. They’re pretty simple. If you need more help, keep reading. Cut out the pieces on the black lines.Follow the directions in alphabetical order.There will always be two of each letter.Make mountain folds on the white lines.These exist in places where you want to fold the fabric under and stitch it to keep it from fraying, so make sure the printed side of the fabric is facing OUT.Sew on the dotted lines, from [ to ]. Most seams match up to another seam on a different piece of fabric. When they do, line the edges up with the printed side facing IN. Some of the pieces require you to pinch a single piece where two matched seams meet. In these cases, fold the piece in half with the printed sides facing IN. Pull the folded piece completely away from the one it’s attached to, so you don’t accidentally sew them together any more than they need to be. Turn the finished bits inside out or outside in as required to match up the edges of the pieces you’re sewing. Turn the entire piece inside out to do stitches M, N, and O, and invert the body again to sew P. Use the eraser end of a pencil to help you turn out the arms and legs. When you’re finished, turn the piece inside-out through the hole in the back. Stuff it with fiberfill, cotton balls, or rice. Fill the small cavities first using small pieces of filling. Use the eraser end of a pencil, the handle end of a paintbrush, or some other blunt tool to get stuffing into small places. Be sure to fill the corners. I put the examples on this site together using a needle and thread. If you want, you can pin the pieces together before you sew but I haven’t found that necessary.